Do Something Constructive: SCREW THIS, ITS TIME TO ROCK. whatever. who cares about all that crap, let's rock and roll! all you portland folk had better come out for a rollicking good time this weekend. 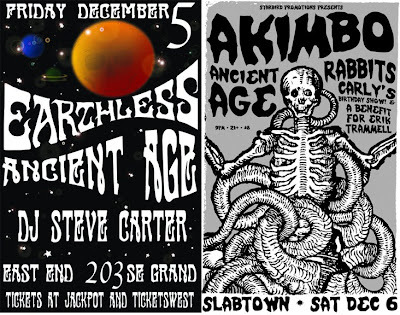 ANCIENT AGE is playing not one, but TWO killer shows this weekend. you can bet your sweet... well, its going to be fun. come get rocked. I remember those exact instructions being written on your whiteboard back when you were in Atl. Also, it's a shame I'm all the way across the country. Earthless is pretty cool, and Akimbo is really great. Hate that I'm missing those shows. You are the cutest ever, my sugarplum. off to buy a white wippee board!